Happy Memorial Day to you other Americans out there. To everyone else, Happy Monday. 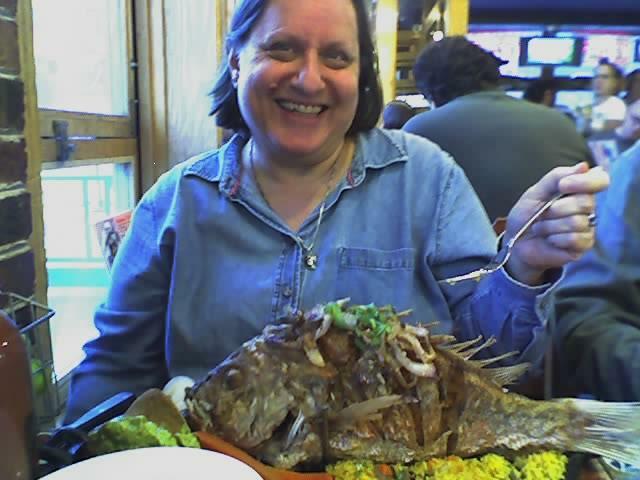 Back when I lived in Austin, one of my sisters was always experimenting with new ways of eating healthy, but they were always slightly odd ways. To her credit, she was the first person who introduced me to the idea of switching to whole wheat bread and pasta, brown rice, and the benefits of fiber. But she was also determined to cut all fat out of her diet, which led to some pretty odd substitutions and combinations. But she had no problem with sugar, and we would find it in some pretty surprising places. She would frequently bring something new to a family get-together, put it in the middle of the table, and after everyone had taken a taste she would say "Isn't that the best _____ in the world?" And I would struggle with how to answer her. Often, the dish was actually pretty good. But I could never bring myself to say it was the best in the world, no matter how good it was, and my sister would get mad that I wouldn't say it. It's not that she really believed it was the best in the world, of course, but she did not understand why I couldn't go with the hyperbole and just say it was. But to me it was like lying, and as silly as it was, I could not say anything was the best in the world if I didn't believe it really was the best. When you add the fact that I have always been a relativist, and do not believe in the concept of best and worst, then you can see why I could never bring myself to say that anything was either the best or the worst of its kind in the world. 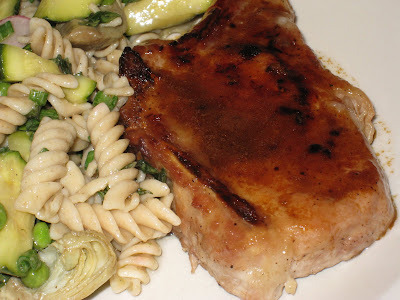 And then I braised some pork chops in beer. And they were THE BEST PORK CHOPS IN THE WORLD. The beer caramelized into a most savory crust and they were moist, succulent and tender and perfectly cooked. I made them a couple of weeks ago and I still can't get over how good they were. I started with two beautiful bone-in chops purchased from the Apple Market. They were nice and thick - so thick I didn't think I could just pan-fry them and I didn't want to bake them. I figured a nice braise was in order. I looked up a few recipes in the Fannie Farmer Cookbook and, being me, tweaked them a little until I got something that seemed like it would work. 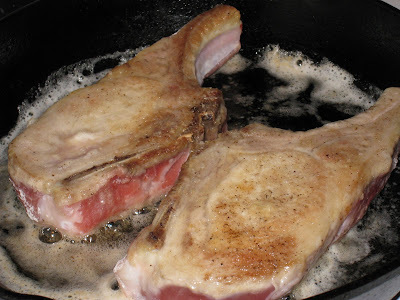 I started by covering the chops with a light sprinkling of flour, followed with a generous seasoning of salt and pepper. Then I browned them on each side in oil and butter for about a minute and a half. I needed some liquid in which to braise them, but I was hard pressed to think of anything that I had handy. It didn't seem worth opening a package of stock for the small amount that I would need; the same applied to taking some of my home-made chicken broth out of the freezer. As I was standing at the open door of the fridge, my eye was caught by the remaining bottles of Shiner Bock standing like steadfast little soldiers at the back of the front shelf. Yes, it was from the six pack I bought last summer when I discovered them at Treasure Island. A beer every once in a while is more than enough for me. Which is a good thing, because it was one of those moments where you just know it's going to work, and work beautifully. After the chops were browned I poured in about a fourth of the bottle of beer. To counteract potential bitterness, I added a scant teaspoon of honey to the liquid. I turned down the heat, covered it, and let it cook for 30 minutes. I turned off the heat and uncovered the skillet with some trepidation. They looked fantastic, but would the chops be cooked enough? Would they be cooked too much? I inserted the thermometer to check, and they were just right. I felt all Goldilocks as I let them sit for a few minutes while I finished up my zucchini and artichoke pasta salad. And then I sat down, cut a piece, and put it into my mouth. Sheer heaven. 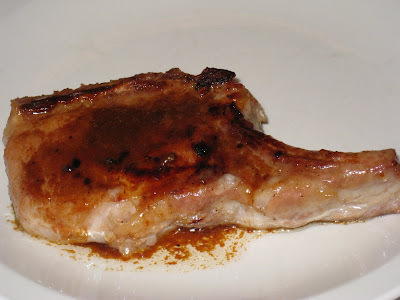 The beer had caramelized into the flour, giving the chop a thin, light crunch with the first bite that melted into a pool of dark, smoky, slightly sweet flavor that swam through the rest of the pork as I continued to chew. Moist, tender, and flavorful all the way through. I savored each and every mouthful of that chop. If, like me, you grew up in the era when fear of trichinosis led to the overcooked shoe-leather pork chop, you have to make these. They are the best pork chops in the world. Heat oil and butter in skillet over medium-high heat. Rinse chops and pat dry. Lay them out on butcher or parchment paper. Sprinkle flour over both chops, lift and sift off excess flour, then turn and lay the other side of the chop on the flour so both sides are evenly covered. Sprinkle top generously with salt and pepper, then lay seasoned side down in the skillet. Brown for about a minute and a half. Season tops with salt and pepper, turn, and brown other side for the same amount of time. Pour the beer into the skillet, and then add the honey. Lower heat to medium, cover, and cook for thirty minutes. Remove from pan and let sit for a few minutes. Meanwhile, raise the heat over the liquid in the pan and let it cook for another five minutes or so, until it thickens. Pour over chops and enjoy. debi, this looks really good, i'm going to try this one, over the summer. it sounds really interesting. Oh good. I wasn't kidding when I said it was the best pork chop in the world. Now I'm a little afraid I won't be able to reproduce it.